Space is one of the frontiers of human exploration. We have numerous technologies that allow us to see into space and collect information like the locations of exoplanets, black holes, and star systems light years away. We have sent many probes and unmanned crafts into space to explore the solar system and understand our neighboring planets, moons, and other large objects. We have sent humans as far as the moon and are planning on sending them further. Humans are not the only living things that we have sent into space before. Starting in 1947, we have sent fruit flies, mice, monkeys, and dogs into space. Despite all the achievements, we have not sent anything beyond our solar system with the intent of interstellar travel and discovery. We are limited by the technology and our lifespan as our technology is slow and takes a long time to cover the distance needed to explore beyond the solar system. It took Voyager over 40 years to get to the edge of our solar system, which was launched in 1977. As NASA and many other space agencies consider sending probes and missions to interstellar space, they are considering options for sending manned missions as well. Before we consider sending humans, we will first be sending much smaller organisms to test the limits of our technologies. The two prime candidates for this are Caenorhabditis elegans, a nematode, and tardigrades, commonly known as water bears. C. elegans is a species of nematode, roundworm, that is about 1mm in length. The genus Caenorhabditis includes many species that live in bacteria and nutrient-rich environments and the C. elegans is no exception. They eat many different kinds of bacteria and have been found all over the world. They live in temperate soil environments but have also been seen in gardens, rotting fruits, and compost bins. They were found on the space shuttle Columbia, surviving the crash, and are even on the International Space Station. They are considered for interstellar travel because they have because they have been extensively researched since the 1960s and are safe for laboratory use (they are nonparasitic). They are also easy to grow, handle, experiment on, and can survive in harsh environments. 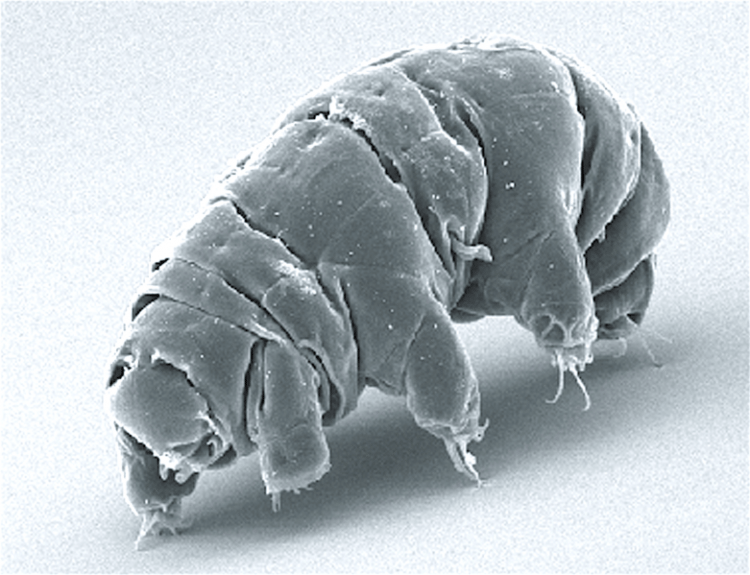 Tardigrades are a phylum of microscopic animals which is composed of a handful of species. Like c. elegans, tardigrades are found all over the world. They are found near volcanoes, rainforests, atop mountains, and even deep below the sea. They are referred to as water bears, space bears, and sometimes moss piglets because their barrel-shaped body and stubby legs look similar to a bear or a piglet. They generally are about 0.3mm to 0.5mm long while some can be longer. Their diet can consist of plants, bacteria, and sometimes other animals. Tardigrades are a very old phylum as fossil records go as far back as 140 million years. They have evolved to become one of the most resilient animals on the Earth. It was thought that they got their resilience from other organisms, through horizontal gene transfer, but recent studies have shown that they had enough time to evolve these features on their own. They can survive extreme cold, heat, salt, radiation levels, and a myriad of other extreme situations that would kill anything else. Scientists have found that they can survive the vacuum of space for extended periods of time and have no damage from that exposure. They are perhaps one of the few organisms that could survive a cataclysmic mass extinction event. For the purposes of interstellar, they are probably a perfect candidate. Professor Lubin and his team from the University of California at Santa Barbara were selected by NASA for Project Starlight, which aims to develop the means to send probes and eventually humans on interstellar travels. The project has a few goals. The first is the creation of a directed energy propulsion for interstellar exploration (DEEP-IN), which is the main focus of Professor Lubin and his team. For DEEP-IN, Professor Lubin and his team are working on developing very small probes that are propelled by lasers into deep space. The lasers focus on reflectors that create photon momentum and propels the craft. In theory, these lasers should result in speeds a fraction of the speed of light. Professor Lubin estimates that it would take something that is 100 kg 3 days to get to Mars using DEEP-IN while it would take something the size of the Orion Spacecraft a month. These are considerably shorter than current times and would be a great boon in space travel both local and interstellar. The other goal is to eventually get humans into interstellar travels and that starts by developing technologies to place humans in stasis. The focus is on stasis because even if we did shorten the time it takes to go between galaxies and even our own planets, it takes considerable time to travel to the nearest star system and further. Even at our fastest with this technology, it would take more than a single lifetime of traveling, significantly less than without the technology, and stasis would keep us alive to arrive at our destination. So, the starlight time will be working on understanding how c. elegans and tardigrades are capable of entering and exiting their own stasis and how we can adapt that to future technologies and induce stasis in humans. They also plan on having them be on the probes they send out eventually so that they can test the biological limits of these organisms. The researchers are looking into developing chambers for them to stay in, how to wake them from stasis, and how to actively observe them while on the probes. The hope is to be able to test how they can withstand g-forcesand see if there are changes in behaviors, genetics, lifespans, and other biological factors. If this is all successful, then we have a way of sending out probes that can give us additional answers about exoplanets and stars that we find via things like Hubble. We could learn more about the possibilities of life and the diversity of planets in our galaxy. As we analyze the organisms on the probes, we may even be able to develop stasis technologies for humans that are more than just science fiction.